Good morning, Friends! 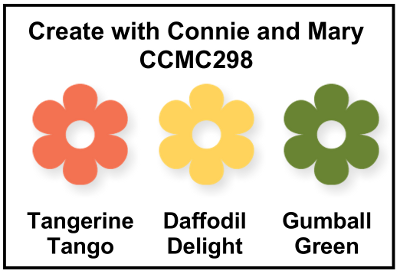 It's Thursday and time for another fabulous challenge from Create with Connie and Mary! This week we have a fantastic color challenge! Take a look at these gorgeous colors! I actually used a lot of white space but I think that these bright colors really pop against it! Find more fabulous inspiration from the rest of the design team at the Create with Connie and Mary website! I hope you will play along with us this week! I can't wait to see what you do with these fabulous colors! 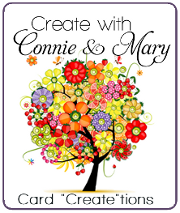 Have you seen all the amazing card sets on the Create with Connie and Mary Cards "Create"tions edition? We are well into week 2 and there is only one more week left! But you can still join today for only $19.95 and enjoy all the projects that have been shared so far! I hope to see you there! Simply beautiful! I love the clean and simple design. 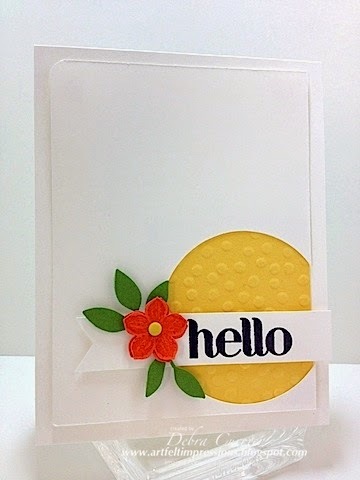 The embossed Daffodil Delight behind the greeting is a great idea! Absolutely love this! Great layout! So fresh and clean! Ever so pretty! Love the simplicity with the bright colors. I love this card Deb - the bright colours look fabulous against the white and I love the layout! Deb, you are the QUEEN of classy cards! I LOVE this! Great job with the color challenge! I love this layout! The bright colors against the Whisper White are so vibrant!